All-black, large and intelligent, with instances of tool use and problem solving. Widespread across North America in a wide variety of habitats. 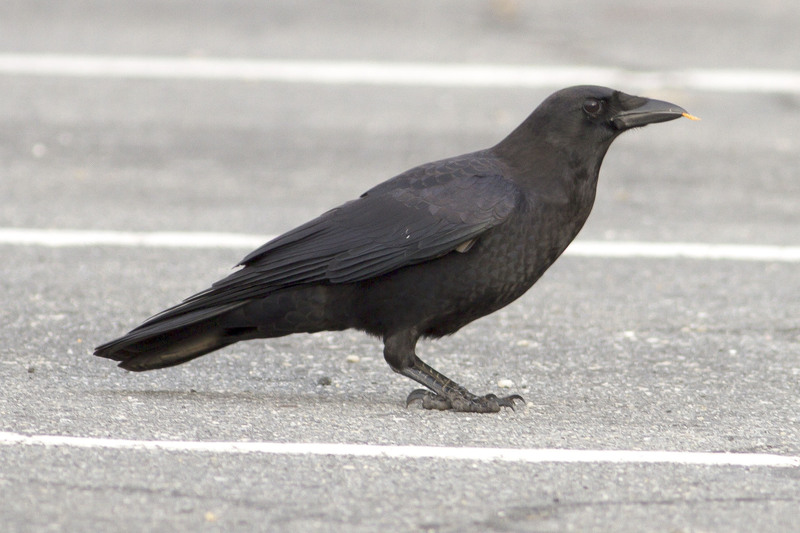 Black with a heavy, straight bill; much larger than blackbirds such as grackles and cowbirds. Loud, hoarse “caw” is a common; flight has a distinctive “rowing” motion. Often seen in flocks, and some roosts number into the hundred-thousands. Flocks may “mob” owls and raptors to chase them off. Infrequent visitor to feeders; wide diet includes insects, invertebrates, fruit, garbage, seed, carrion and small animals. Young are often raised by family groups. Lifespan up to 16 years in the wild, and over 50 years in captivity. Population ~ 30 million and stable.